Eligible and Interested candidates can apply for Head Constable posts through online mode only before closing date 23rd October 2018. 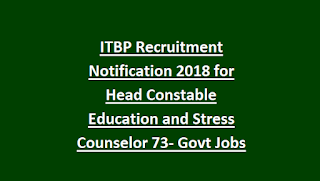 The official website for applying Group ‘C’ Head Constable Education and Stress Counselor posts is www.recruitment.itbpolice.nic.in. The educational qualification for these jobs is should be passed Bachelor’s Degree from the recognized university. The selection process for the candidates is based on written exam and interview. 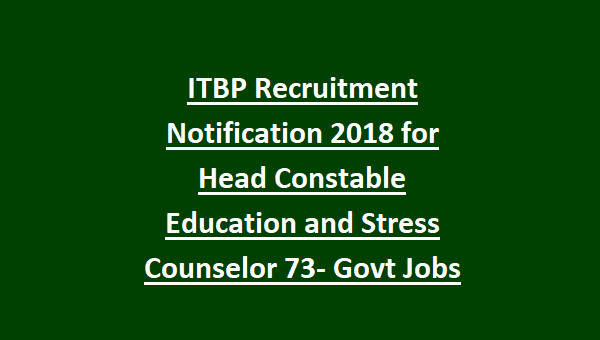 For the other details about the salary, age limit, how to apply online and complete details of education qualification are given below for the ITBP Head Constable Recruitment Notification 2018. As on 01-09-2018 candidates age is in between 18 – 30 years. For the reserved candidates the age limit relaxation will be applicable as per the Government norms. The education qualification for Group ‘C’ (Head Constable) posts is candidate should have passed Bachelor’s Degree from the recognized University. Salary offered for the selected candidates is Rs.25500 – 81000/-. The application fee for the candidates belongs to General/OBC is Rs.100/-. There is no application fee for the reserved candidates SC/ST/PWD. The Candidates will be selected Based on merit in written exam, Physical fitness test and finally merit in Medical Examination test. Written exam pattern will be consists of 100 objective type questions completed in 3 hours. Skill test will be typing test on computer. Interested candidates can apply through online mode only. The official website for applying Head Constable posts is www.recruitment.itbpolice.nic.in before closing date 23-10-2018. Candidates can pay the application fee at the time of form submission.